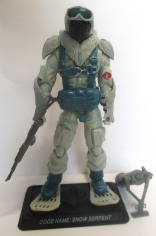 Notes: Sunbow's Snow Serpents wore the 1985 outfit but had a white face mask, belt, and chest straps. The shape of the eyeholes in the mask varied. The DiC series used the 1991 outfits, with pink snowboards and red-striped laser pistols. Accessories: grey AK-74 rifle with T-shaped stock (new), grey mortar tube with protruding missile, and angled Y-shaped mortar stand (new), dark blue parachute belt (new), white pair of pointed tear-shaped snowshoes (new), large white backpack with stuffed pouches (new). Snow Serpents are the Arctic Specialist branch of the Eels (COBRA Frogmen). They must undergo the same rigorous training program as the Eels with the addition of a six month cold weather course somewhere above the Arctic Circle. Other aspects of the training include airborne operations (under arctic conditions), anti-tank procedures and the use of snow-shoes, skis, and kayaks. "If the Eels are the elite of COBRA's naval branch, then the Snow Serpents are the best of the best. How else could you characterize an individual who would parachute onto an ice floe in sub-zero temperatures and then be prepared to march 50 miles with full field pack, assault rifle, and anti-tank weapon?" Accessories: white wrapped pistol with scope and peg on grip for hose (new), white wrapped machine gun with long scope and peg on grip for hose (new), purple spring missile launcher with scope (new), white spring missile with fins near midpoint (new), purple backpack with rack for snowboard, pegs for hoses, and hole for launcher (new), purple snowboard with foot peg on scaly surface (new), two medium-length black hoses (common). SNOW SERPENTS are the Cold Weather Environment Specialists of the EELS, and are specially trained and equipped to fight under Arctic conditions that would give a polar bear frostbite. Equipped with down-filled suits heated by the same backpack heating system that circulates hot air through the working parts of their weapons, Snow Serpents can continue to fight in temperatures low enough to freeze the bolts of most G.I. Joe weapons. "A Snow Serpent is expected to endure rigorous physical and psychological training as part of his everyday existence. His barracks are unheated, his mess hall doesn't serve hot food, and it's considered a point of honor to take nothing but cold showers. All of this enhances his ability to be a formidable Arctic fighter, mainly because it makes him exceedingly mean-tempered and nasty." Vehicle Proficiency: Cobra Grade 7. Licensed to operate: Heavy attack vehicles, including Polar Class Ice Saber [sic, should be Sabre]. Toy Notes: Item #6585. The prototype pictured in the catalog has a purple missile. The missile launcher was reused in different colors for 1993's Transformers Generation 2 toys Jazz, Sideswipe, and Onslaught. Accessories: black submachine gun (88 Hit & Run's), black figure stand (common). Cobra has recently developed a weapon so dangerous that it threatens the safety of our entire planet! Perched high upon Mt. Everest, what is believed to be a giant thermal conversion laser cannon stands ready to strike targets at strategic military base camps and heavily populated world cities. The laser cannon must be destroyed to prevent global devastation, a task perfectly suited for G. I. Joe's elite Arctic Attack Force. With SUB-ZERO�a winter operations specialist�leading the mission, he's assigned DEE-JAY to climb Everest and plant explosives at the base of the laser cannon. For them to succeed it will be up to STALKER and Sub-Zero to fight off platoons of SNOW SERPENTS, Cobra's polar assault troopers who specialize in Arctic warfare and have adapted to Mt. Everest's freezing winter temperatures. The mission is risky, but the job has to be done . . . FAST! Toy Notes: Exclusive to the mail offer Terrifying Lasers of Destruction, along with Sub-Zero, Stalker, and Dee-Jay. Accessories: white pistol (91 Snow Serpent's), white machine gun (91 Snow Serpent's), black backpack (91 Snow Serpent's), blue-grey snowboard (91 Snow Serpent's), medium-length black hose (common), black figure stand (common). Snow Serpents are the arctic specialist branch of the EELS (COBRA frogmen). They are specially trained and equipped to handle the cold weather. Each soldier is Airborne qualified and licensed to operate COBRA's full arsenal of Polar attack vehicles. Their methods include low opening parachute drops and bombarding their enemies with anti-tank weapons. These elite troops use the latest advancements in down-filled, heated suits, allowing them to fight in temperatures low enough to freeze the bolts on most G.I. Joe weapons. Snow Serpents are expected to endure rigorous physical and psychological training as part of their everyday existence in Polar regions. They can march 50 miles with full field packs, then go for a swim in sub-zero ice flow just for the fun of it. All of this activity enhances their ability to become formidable arctic fighters, mainly because it makes them exceedingly mean and nasty - perfect traits for COBRA. From the G.I. Joe files: "Snow isn't the only thing dropping from the sky. These guys are the best at what they do - and that's trouble for us. If they surround your base camp on a cold winter's night, you'd better hope your insurance is paid up." 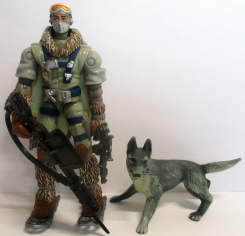 Toy Notes: Carded in a Toys 'R Us-exclusive Cobra Polar Force three-pack with Firefly and Night-Creeper. Item #57068. Accessories: silver pistol (87 Cobra commander's), black machine gun (88 Spearhead's, with Sound Attack tab), grey German Shepherd with black stripe on back and white underbelly (87 Law's), brown plastic cape with some white "snow" (new), silver pair of snow shoes with two foot pegs each, rounded in front (new). Candidates for the SNOW SERPENT unit are specially selected from the ranks of the elite EELS (COBRA frogmen) cadres. They are screened for optimum strength, endurance, and motivation, and then subjected to a grueling and dangerous training program with over a fifty percent drop out rate. In order to graduate the trainees must complete a HALO (High Altitude Low Opening) jump in a blizzard, ski cross country fifty miles carrying a hundred pound pack, hit over 95% of pop-up targets on the combat range, and swim a hundred meters in freezing water while carrying fifty pounds of ammunition. SNOW SERPENTS are expected to operate in conditions where other less hardened troops would simply hunker down and wait for a break in the weather. If they could enter the biathlon, they would sweep the event hands down. On the downside, they tend to get listless and complacent in warm weather. Flame weapons can really ruin a SNOW SERPENT's day. This is why they have a picture of BLOWTORCH on the dart board in their rec room at COBRA Headquarters. "We don't mind jumping from planes in bad weather and skiing across mine fields while under fire. We'd rather do that than march around a parade ground and stand in formation." Toy Notes: Carded in a two-pack with Blowtorch. Item #53207. Accessories: brown cape with lots of white "snow" (02 Snow Serpent's), silver pair of snow shoes (02 Snow Serpent's). Candidates for the SNOW SERPENT unit are specially selected from the ranks of the elite EELS (COBRA frogmen) cadres. They are screened for optimum strength, endurance, and motivation, and then subjected to a grueling and dangerous training program with over a fifty percent drop out rate. In order to graduate the trainees must complete a HALO (High Altitude Low Opening) jump in a blizzard, ski cross country fifty miles carrying a hundred pound pack, hit over 95% of pop-up targets on the combat range, and swim a hundred meters in freezing water while carrying fifty pounds of ammunition. SNOW SERPENTS are expected to operate in conditions where other less hardened troops would simply hunker down and wait for a break in the weather. If they could enter the biathlon, they would sweep the event hands down. On the downside, they tend to get listless and complacent in warm weather. Toy Notes: Item #55429. Due to uneven distribution, this vehicle was considered a hard-to-find item at the time of its release. 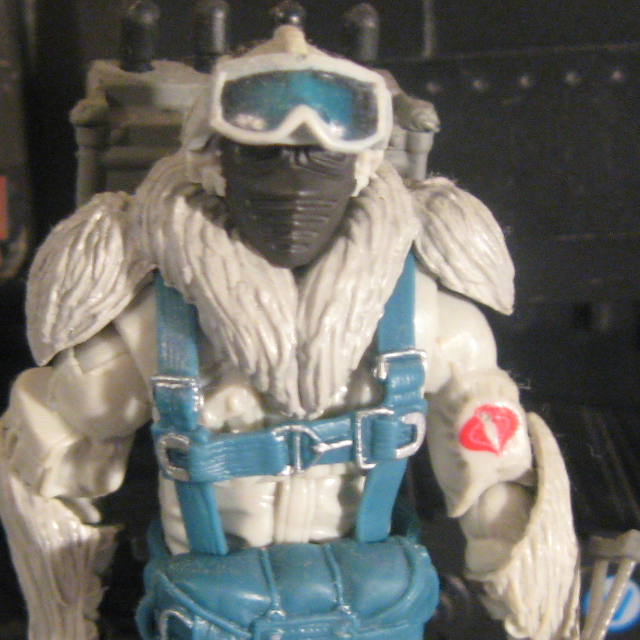 Distinguished from the first version of Snow Wolf by the solid Cobra emblem on this figure's upper right arm. Accessories: grey pistol (04 Firefly's), dark grey machine gun (05 Duke's), white helmet with black muzzle and blue goggles (04 Snow Wolf's), blue belt (85 Snow Serpent's), black pair of rounded tear-shaped snowshoes (new), white backpack with black roll (85 Snow Serpent's). Candidates for the SNOW SERPENT unit are screened for optimum strength, endurance, and motivation, and then subjected to a grueling and dangerous training program with over a 50% drop out rate. In order to graduate, trainees must complete a HALO jump in a blizzard, ski cross country fifty miles carrying a hundred pound pack, hit over 95% of pop-up targets on the combat range, and swim a hundred meters in freezing water while carrying fifty pounds of ammunition. SNOW SERPENTS operate in conditions in which less hardened troops would hunker down and wait for a break in the weather. If they could enter the biathlon, they would sweep the event hands down. On the downside, they get listless and complacent in warm weather. Accessories: grey AK-74 assault rifle with hollow stock, angled grip, and curved magazine (new), light grey mortar and stand (85 Snow Serpent's), white fur-lined collar and shoulder pads (new), white pair of tear-shaped snowshoes with holes for figure stand (new), large white backpack with stuffed pouches (new), black Cobra figure stand. SNOW SERPENTS are the Arctic Specialist branch of the COBRA EEL unit (COBRA frogmen). They must undergo the same rigorous training program as COBRA EEL troops with the addition of a six-month cold weather course somewhere above the Arctic Circle. Other aspects of the training include airborne operations (under arctic conditions), anti-tank procedures and the use of snowshoes, skis, and kayaks. "If the COBRA EEL troops are the elite COBRA naval branch, then the SNOW SERPENTS are the best of the best. How else could you characterize an individual who would parachute onto an ice floe in sub-zero temperatures and then be prepared to march 50 miles with full field pack, assault rifle, and anti-tank weapons?" Heavy Weapons Accessories: grey rifle (08 Snow Serpent's), light grey mortar and stand (08 Snow Serpent's), white collar (08 Snow Serpent's), white pair of snowshoes (08 Snow Serpent's), white backpack (08 Snow Serpent's), black Cobra figure stand ("SNOW SERPENT"). Polar Combat Accessories: black shotgun (03 Burn Out's), black spring launcher with grey sling (08 Sgt. Bazooka's), four black missiles (08 Sgt. Bazooka's), white collar (08 Snow Serpent's), white pair of snowshoes (08 Snow Serpent's), grey backpack (08 Sgt. 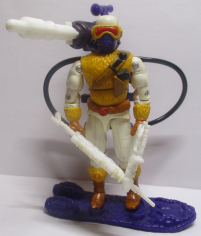 Bazooka's), black Cobra figure stand ("SNOW SERPENT"). SNOW SERPENT troopers are expected to operate in conditions in which less hardened troops would simply hunker down and wait for a break in the weather. They are chosen for their endurance and strength, then honed even further to be able to withstand the most extreme polar environments on Earth. If they could enter the biathlon, they would sweep the event, hands down. On the downside, they tend to get listless and complacent in warm weather. As part of an elite assault squad, this SNOW SERPENT trooper guards a COBRA weapons system under construction in the Arctic. SNOW SERPENT troopers thrive in extreme cold. They undergo brutal training that hardens them to sub-zero temperatures, avalanches, hidden crevasses opening underneath their feet, and perpetually frozen faces and food. To do their job, they must be able to work at optimum efficiency in spite of the harsh conditions. SNOW SERPENT troopers in charge of anti-tank systems are experts at adjusting weapons and trajectories to allow for variables wrought by arctic weather conditions. Anyone hoping that a trooper's fingers are too numb with cold to be able to blast a tank into a million pieces is truly out of luck. "One of the perks of firing a rocket launcher is seeing that big bang when you hit the target. The other benefit is that lovely blast of hot air that you get from the explosion." Variations: As detailed above, the two figures in the Extreme Conditions set differ in their filecard and accessories. The figures themselves are identical. They are distinguished from version 8 by a silver buckle on the belly pack. Toy Notes: One Heavy Weapons Specialist and one Combat Specialist were sold together in the online-exclusive boxed set, along with Snow Serpent Officer, Scrap-Iron, Tele-Viper, and two versions of Cobra Viper.